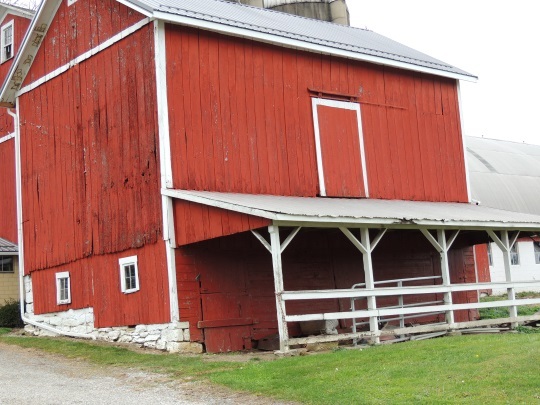 Reader Frank shares a few photos from a recent visit to Holmes County, Ohio. No snow in these shots, but lots of nice views. While shopping at Hershberger’s Store outside Berlin, an elderly gentleman explained to the cashier that he had lost a money clip with $1,200 and was trying to back track everywhere he had been the last day. Believe it or not, someone had actually turned it into Hershberger’s and they held onto it until it’s owner returned (I will say only in Holmes County on this one). Next, we were standing in line at a place called “Mrs Yoder’s Kitchen” in Mount Eaton Mount Hope. 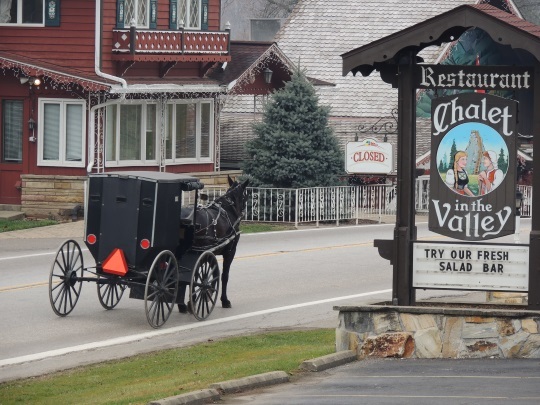 A young Amish gentleman was trying to pay for his meal with a credit card that had the chip inside and his card was not working (I could see the activation sticker still on it and realized he had not called). Long story short, I paid for his meal not knowing it was also for 5 of his co-workers ($90.00 with the tip!). But fear not, the young man gave us his address to his house and business and invited us over where he kindly repaid us. The area was truly a step back in time with great people around every corner. Ever have something similar happen? Wherever you might be, I hope you enjoy another little virtual visit to one of my favorite places. And thank you to Frank for passing these photos along. Great pictures from Holmes County an area close to me. Beautiful pictures! Without doubt, this is one of my favorite places in our whole country. If it wasn’t for being with my family, I would live there. I have often wondered how the horses make it up those hills in snowy weather. 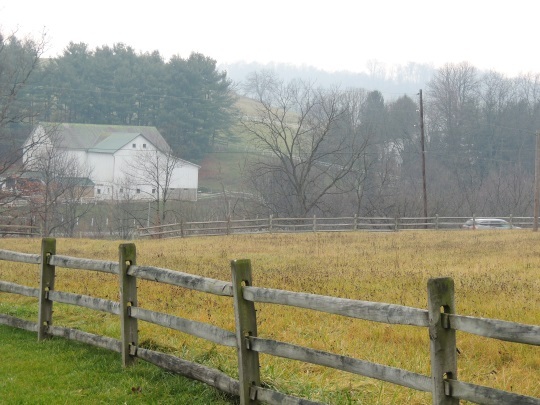 We usually visit the beautiful Holmes County area once or twice a year. Beautiful countryside and great shopping areas. Always a feeling of calm when visiting..a special quaintness. 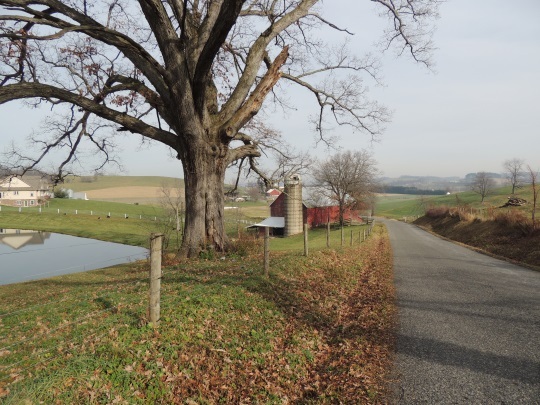 We travel there even though we actually come from an area of Amish settlements in Mercer County, PA.
Beautiful photos and wonderful stories. Merry Christmas everyone! How nice to see pictures from my home community! I recognize most of the places and some come from my home neighborhood. Harriet, you wondered how horses get up the hills in snowy weather. I’m usually more concerned with going DOWN the hills. Many of our back-roads are tar & chip, which is cheaper, but definitely not as nice as real paving. In warm weather the tar “bubbles up” and when biking you hear a pop,pop,pop as the bubbles burst and stick to your bike. Walking on such roads causes some tarry soles on shoes, too. 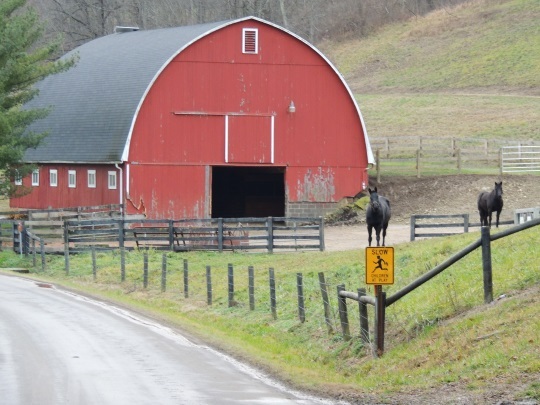 In cold weather those roads seem to get very slippery and we need to use caution on hills as a horse can start to “skate” if the road is too slick. We do have hydraulic brakes, but if one brakes too hard, the rear end of the buggy can fish-tail. Oddly enough this seems to be less pronounced once it gets severely cold. (Either that or we adapt OR the cinders & salt on the road take care of it.) Going uphill is usually done more slowly, naturally, but still, on slick roads a horse needs to move carefully. Thanks, Mark, for the information. Going down the hill didn’t seem as much of a problem, as gravity helps there! Ha!! That’s interesting to hear about the grips. I just felt sorry for the horses having to pull all of that weight up the hill. I know what you mean about the tar popping. I was raised in the country and remember that quite vividly. This weekend I got to move back to the country, well closer to the country than I was living. I moved in with my son and his family!! Yeah!! You’re welcome, Harriet. And congratulations on your move to your son’s home in the country! 🙂 A joyous Christmas to you and yours as well. Thank you Mark for the added info on Holmes Co. 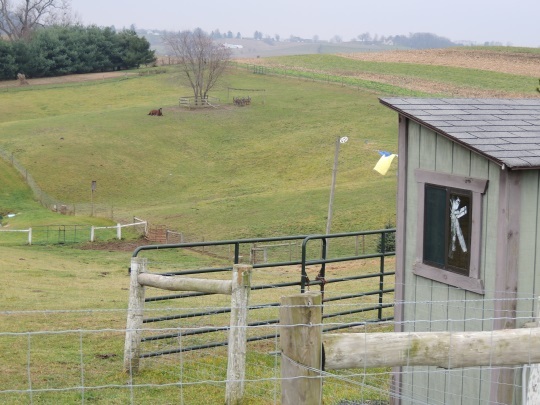 I am very interested in the Amish “Simpler” way of life. 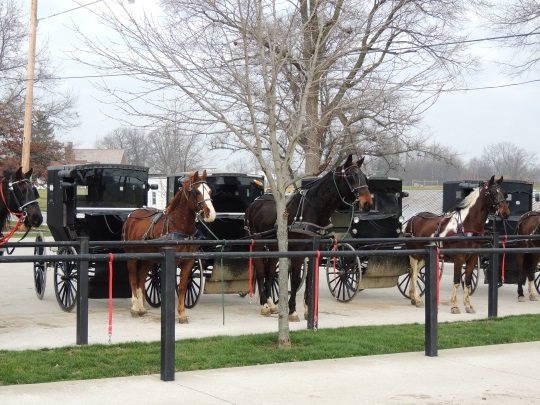 We live in Lancaster County, PA and are quite used to what the Amish and Mennonite folks bring to our community. We travel to Holmes County at least once a year simply because I feel at peace in this special place. 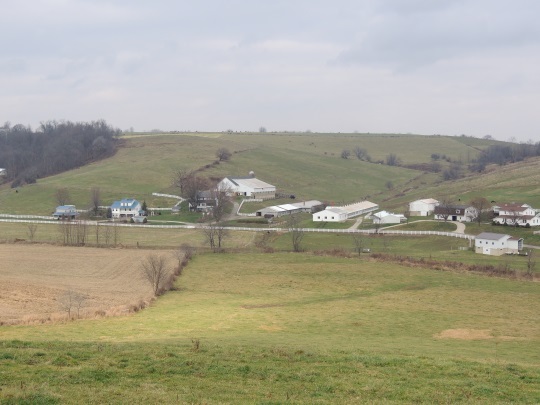 Herschberger’s farm is like a magnet to me. As a city girl from California, a hands-on experience with farm animals NEVER fail to thrill and amaze me. Thank you so much. I wish someone could provide this experience in Lancaster County as well. Loved the photos and I want to come visit soon. Happy New Year! Love the pictures and can’t wait to be able to go to Holmes County again next year. Such beautiful country. Merry Christmas to everyone. Mrs. Yoder’s Kitchen is in Mount Hope, Not Mount Eaton. Of course it is. Missed that. Thanks for the catch, fixed it above. Thank you for sharing the beautiful pictures and stories. 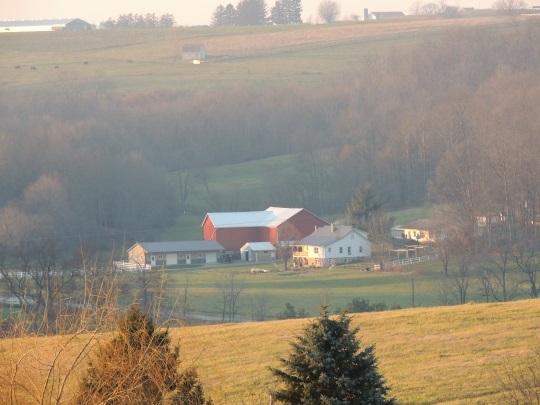 I love Ohio’s countryside, but not in the Winter. I am a Florida girl after all. Its always nice to see pictures of the area where I was born and raised. Living over 2,000 miles away from this area now, I realize why people look at this area as quaint and/or beautiful. I feel like a tourist myself whenever I go back! Love the pictures. Thanks for sharing. Absolutely love visiting that area when time permits. So peaceful and beautiful and the folks are friendly! Thanks to Frank (and Erik) for sharing the photos. Talk about peace on earth! A heartening story, too! You’d hardly know these were taken in December (thanks to el Nino, I hear). All that green (and so vibrant, in places) makes it look more like early spring and Easter rather than Christmas. It’s the same way here in Illinois-I told my husband we might need to get out the mower again, what with all the rain and temps in the 50’s & 60’s/ I am, however, grateful for not having to shovel this holiday season. I imagine the horses are enjoying it, no? I have visiting Holmes County way up there on my bucket list! Peace to all this Christmastime, and in the leap year to come. 🙂 enjoy that “extra” day! 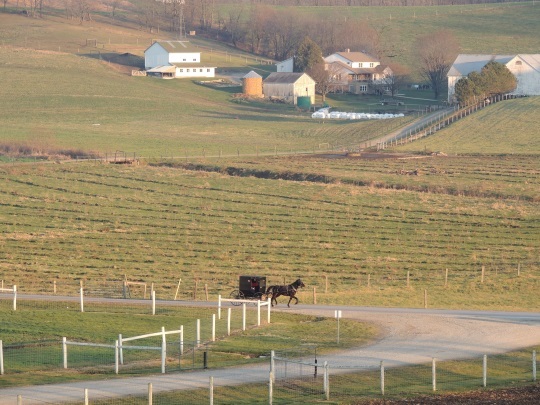 I am a distributor of Amish scenery calendars and I am always looking for a new photos. If your pricing is reasonable and you are open to offering some photos for sale, I would like to discuss it with you. Thanks. Love the article and the photos. One day I will get there to see it in its beauty. Even still- Holmes is unquestionably beautiful- we never tire of visiting. Thanks for the great pictures, & I too feel it must be nice for the Amish to not have to deal with snow this year for travel (so far). We are all rejoicing over the much needed break of usual hard winters. Valerie, I live in the Berlin area and the traffic can be really bad at times. It can be frustrating to try and negotiate Berlin traffic in a horse & buggy during the busy season! I much prefer to bike into Berlin if I need anything. We also drive in on the back road and often tie our horse at the rack on the side street and do much of our business on foot. If you get into Berlin in the early morning it’s usually not quite as bad. I have not been in a lot of the Berlin area shops, not being really interested in gift & souvenir shops, but there are some nice stores in Berlin. I hear a lot of visitors to our area saying how disappointed they were in how commercial Berlin has become. One guy said he felt it was like an “Amish Disneyland” but there was nothing truly Amish about it. There was actually a song written called “The Berlin Blues” about how locals feel about the busyness of Berlin. When I hear visitors express their disappointment in Berlin (and to be fair, there are literally thousands of visitors who absolutely love Berlin!) I like to steer them towards the smaller family owned stores & businesses out on the less crowded roads. For those looking to shop in Amish-owned family stores that’s a better option — but for the thousands who love the shops in Berlin, that’s their pick. By tourists young and old. This was written by a non Amish person living in Berlin. It’s kind of tongue in cheek and could go for a LOT of small towns in popular areas. I think a lot of us can get ticked at the traffic and crowds, but we welcome the visitors and want to share our community with everyone. Yes, I found out there’s no snow almost anywhere except Idaho this Christmas according to the National Weather Service. In fact, I heard this morning on the radio that it’s going to be the warmest Christmas on record in the United States as a whole (not for us in California, though. We’ve got El Nino keeping us wet and cold). I wonder if the Amish farmers are being effected by this weird global climate change in terms of crop production. Has it effected the yield in any way? Increased, decreased? Has anyone heard anything about it? That’s one thing I wondered about Amish farmers. Do they use irrigation water from the county? Are the crops only watered by the weather? Do they have any restrictions from the Ordnung about water from the grid? The only farmers I know of in our area who irrigate are produce farmers. I’ve never heard of anyone irrigating with water from the waterlines. That could get expensive! I know of some who draw their irrigation water from farm ponds and the like. We used to live in a home where we had our own well and pumped our water with a motor. It was excellent water for washing, but not great for drinking or plants, so we had a water filter system for our drinking water and used rain water for watering plants. Now we have a home where we are on the waterline, so we pay for our water. In some ways it’s nicer — the pressure is consistent, it’s good drinking water, and the convenience of not monitoring the water level and pumping it is nice, but I still prefer rain-barrels for watering plants. 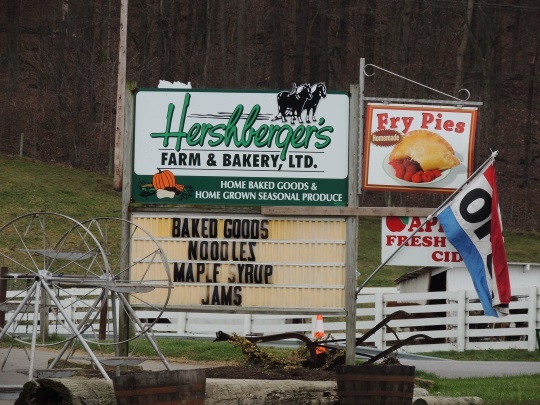 I enjoyed the pictures, too, but want to make a comment in response to Erik’s question about similar experiences to Frank’s two anecdotes re: stores in Amish communities. My favorite memory is from about 20 years ago. I was in the Kalona, Iowa, Amish community and stopped at Community Country Store, an Amish store east of Kalona. I saw a pair of shoes like I wear, but had no idea that I would see those shoes in an Amish store. I didn’t have enough cash to pay for them, but I did have my checkbook. I was about 550 miles from home, so didn’t think they would take my check, but asked anyway. The clerk said, sure we take checks, even out of state ones. I wrote the check and gave the clerk my check and ID. She immediately handed my ID back and said she didn’t need it. I said, “But you don’t know me.” She said, “Yes, I do, I didn’t know you before you came into the store, but I know you now.” We then had an interesting short conversation about how she takes checks, even from people she’s just met from out of state. She said if the check was no good, that was between the check writer and God, but she felt what God wants her to do is to trust people. Great story Al. Even if she gets burned occasionally, which I doubt happens often, she has cultivated a trusting heart. You can’t purchase that with money. Like I said: here I am, late to the party, again! 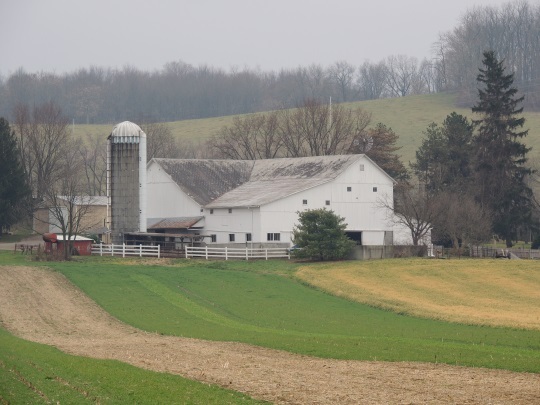 Until Al in KY added his story, I hadn’t thought about it … but I had a somewhat similar experience with an Amish harness maker in Mercer County, PA about 32 or 33 years ago. I was in the area on business with the company that I worked for and ended up there for the weekend. I had stopped in several Amish owned businesses during the week, but more just snooping around than actually looking to buy anything. Shortly before I left to go on this particular trip I had priced a set of buggy harness and a collar for a light mare that I had a that time. I had priced it at a shop that sold tack; western saddles and bridles mainly, but some harness. The harness that they had was lightweight and nothing special in the way of construction. They wanted about $800.0 for the harness and $200.0 for the collar & those were 1982 or ’83 dollars, worth far more than the dollar is worth today. That Saturday morning I was out scouting around one of the local Amish communities, when I saw a sign for a harness shop. So I decided to drop in and see what he had in the way of buggy harness. The owners name was Roman B. and he had been making harness in that community for about 20 or 25 years. When I explained what I was looking for he showed me several basically similar options and I choose the one that I thought would best suit my needs. He informed me that he didn’t really have any already made up, but he would be glad to make some to my specifications and ship it to me. When I asked how much this would cost he said: “Well I generally only make harness for our people, and much of that is not a cash sale … so I’d have to think about it for a minute”. Finally he said: “How about $270.0? Does that sound fair?” I told him that was a far better price than I could buy it for at home and his harness was much heavier and of a far superior quality to my other option. That did not faze him, and he did not adjust his price upward. So I told him the size and weight of the mare and what size collar she would need, then realized that I had forgotten about the price on the collar. When I asked about it he said: “Oh that price INCLUDES the collar; $225.0 for the harness and $45.0 for the collar”. AMAZING! My only problem was that I hadn’t really brought any extra cash with me to purchase something like harness and I don’t think I even had a credit card at that point in my life. Seeing as I would still be in Pennsylvania, New York and Massachusetts for about 10 more days I didn’t want to use up too much of my cash anyway. I did have my checkbook with me, so I asked if he would take a check written on a bank in Texas. He told me that he was planning on shipping the harness to me, with an invoice enclosed and I could mail the check to him! Best I can recall, I think I ended up insisting that he take a check for half the cost of the harness and collar and told him that when he shipped it to me I would send a check for the rest. Sure enough about three weeks later a big box arrived at my doorstep with some of the nicest quality harness a person could buy. I was delighted to mail the balance due to him. Everyone that I ever told that story to was shocked that he would be so trusting. I think that it says something about the broader American society that we can’t ALL do business that way. BTW: Roman and I sort of became pen pals for quite a number of years, but eventually I lost contact with him. I’ve often wondered if he is still alive, but even if so I am quite sure that he is long since retired. Regardless, I still have that harness though I don’t have a horse that it would fit. Thanks for prompting my memories Al. Hi Erik, What great pictures! This is truly a lovely community and one that many others (especially “new” ones) probably wish to emulate. We were recently in MN visiting Ed and Ruth and the boys. That community still looks as if it’s struggling. 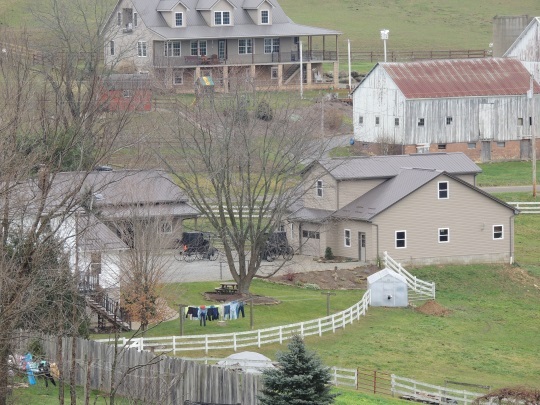 But they are making progress and every time we visit we see more ordered looking farms and homes. We got some great pix ourselves which I’ll try to send you at some point. I hope all of you have a blessed Christmas! That would be great Anne, looking forward. And a blessed Christmas to you and the family. 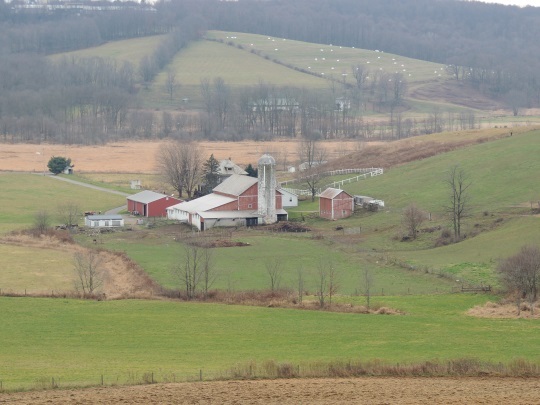 Thanks for the great pictures of Holmes County farm land, etc. When I lived in Ohio would go there for a day of rest and enjoy the folks and fine food. Have always liked being around the Amish, I like the simple way of life and their respect of GOD. Sure beats Fort Worth where I live now.